Oh what a lovely Christmas morning traditions you have developed with your entire family! Love the adding of a piece of straw for something kind. Had to laugh out loud with your last remark about the proportions being a little off. 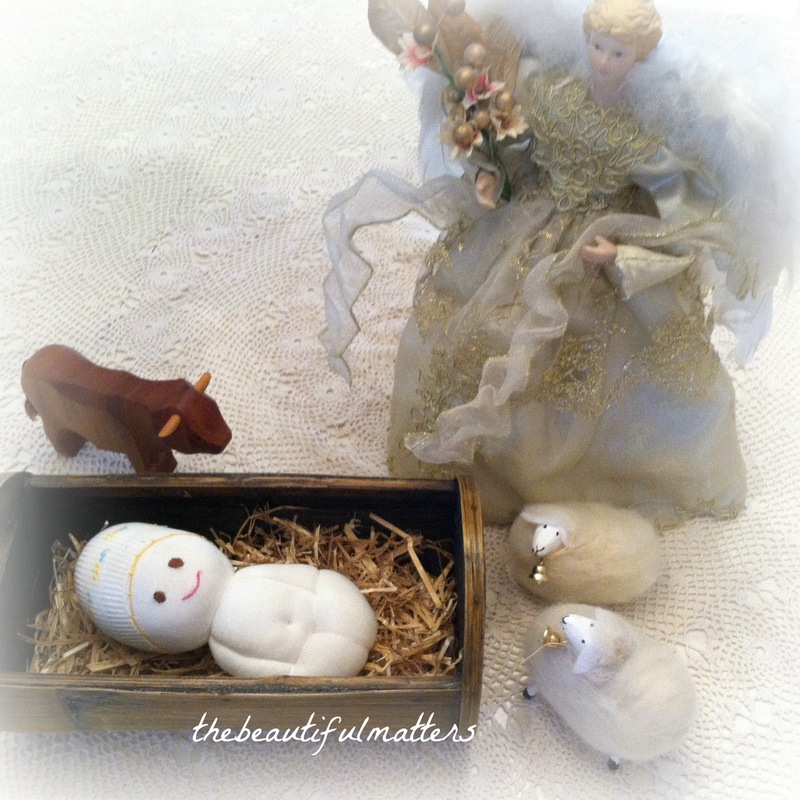 Well, if one eats too often from this baby Jesus' birthday cake (loaded with sugar!) the proportions might get a little off too. 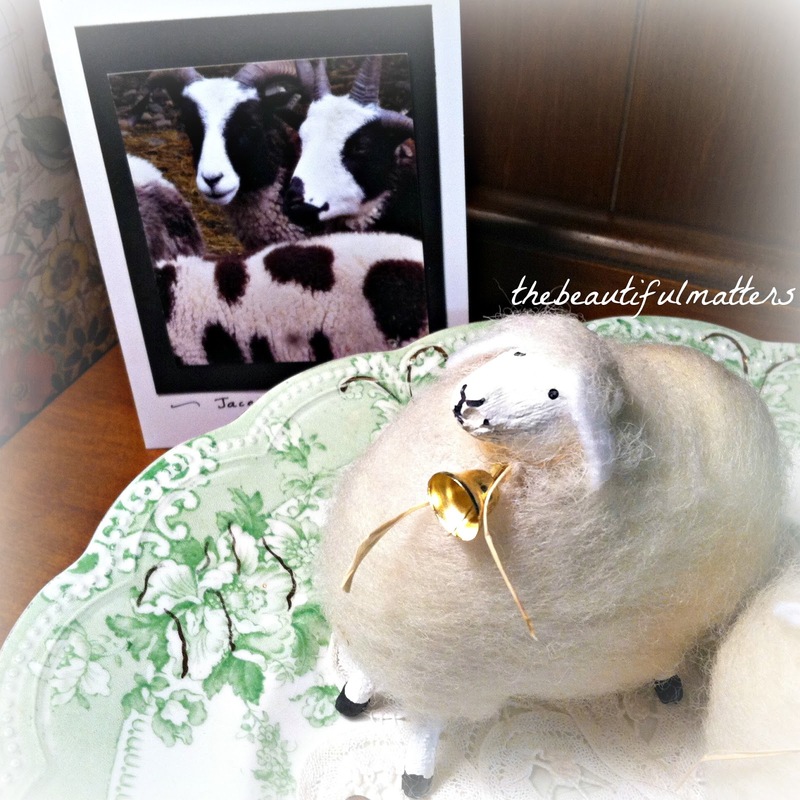 Dear Deborah ~ What a lovely post and an added delight of your having a pair of Kathy's sheep. I think they are so adorable and mine make me feel joyous when I look at their dear faces. Your traditions are sweet, and your birthday cake for Jesus sounds delicious. I think I will make that myself. 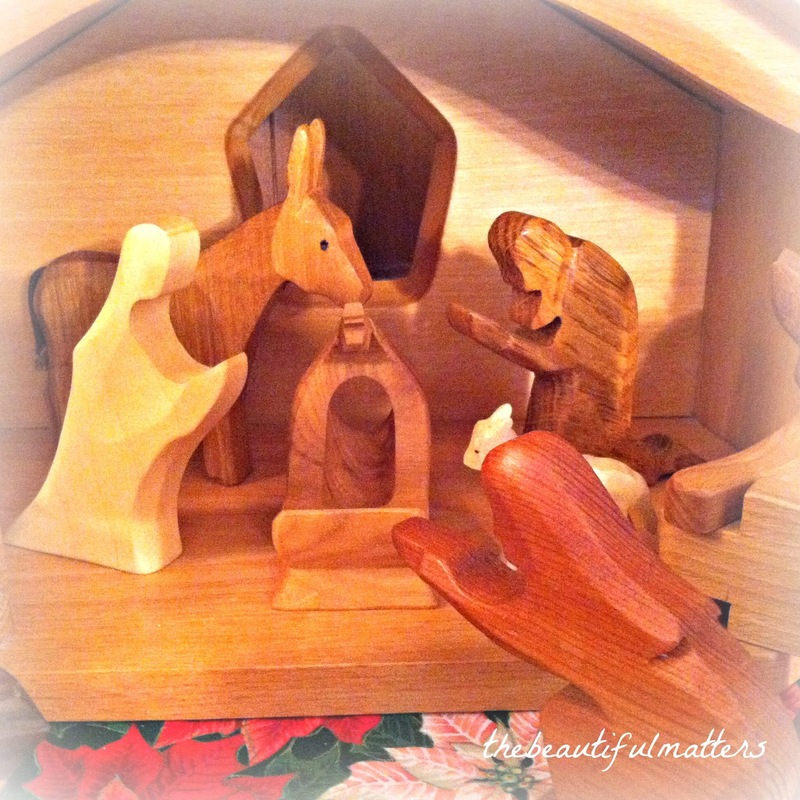 Hi Deborah, such a beautiful nativity and family traditions for Christmas morning with your loved ones. The coffee cake looks so delicious. Love the sweet little sheep looking up. 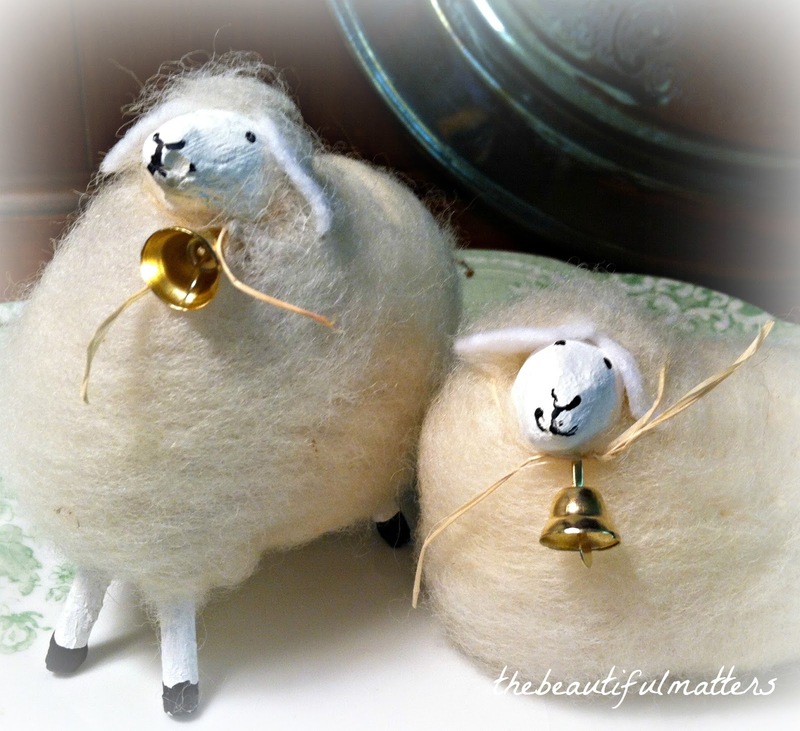 What a talented artist and to create these from the wool of her own sheep. Fabulous. What a darling baby Jesus. Thank you for sharing your traditions. Thank you for sharing the recipe, it looks delicious! You have such lovely Christmas traditions. 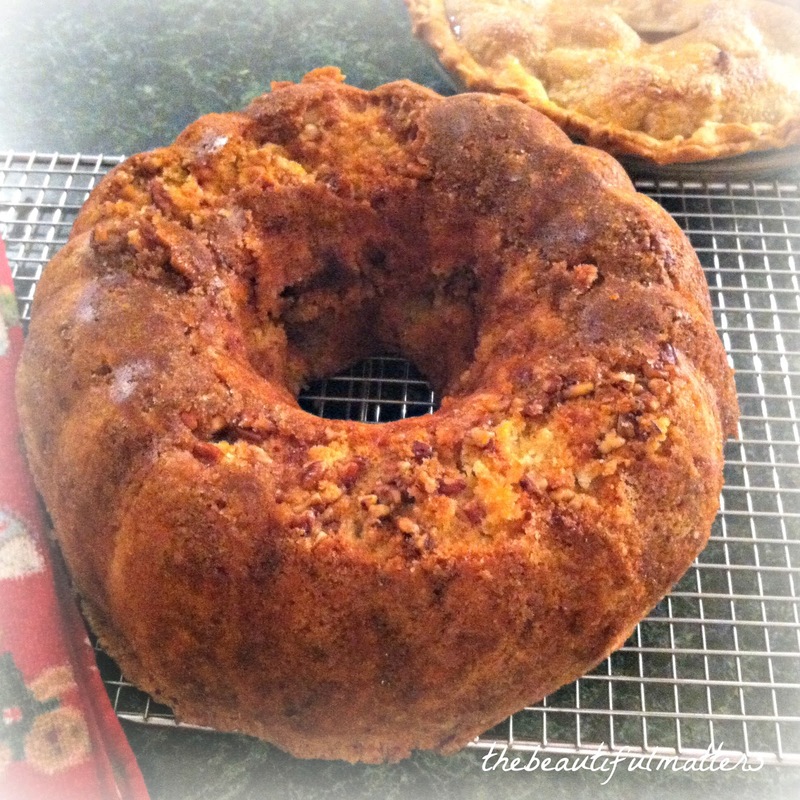 The coffee cake does look delicious! 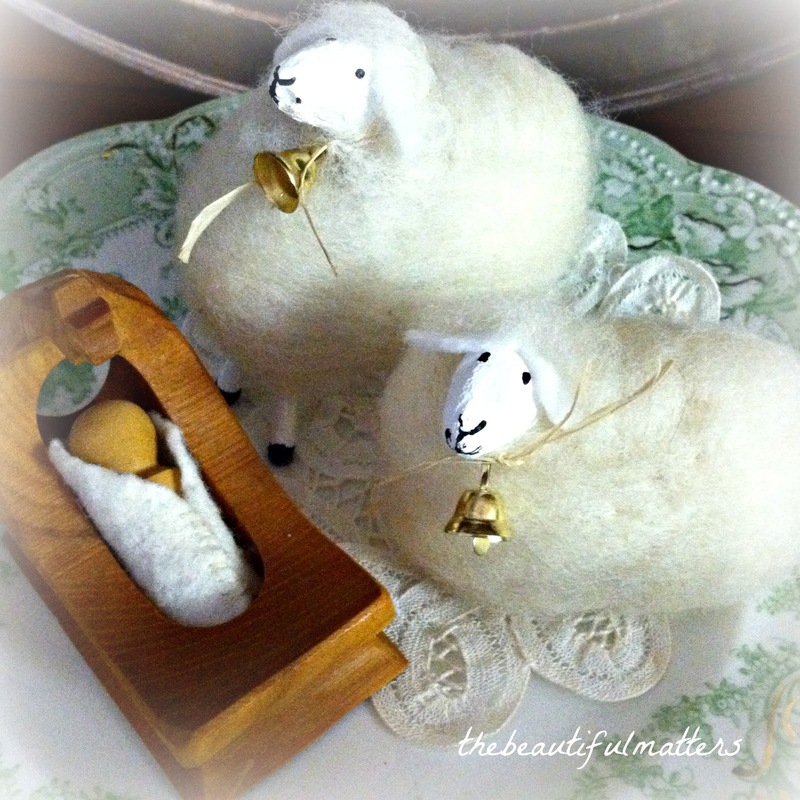 I love the sheep, Deborah, and the darling baby Jesus. 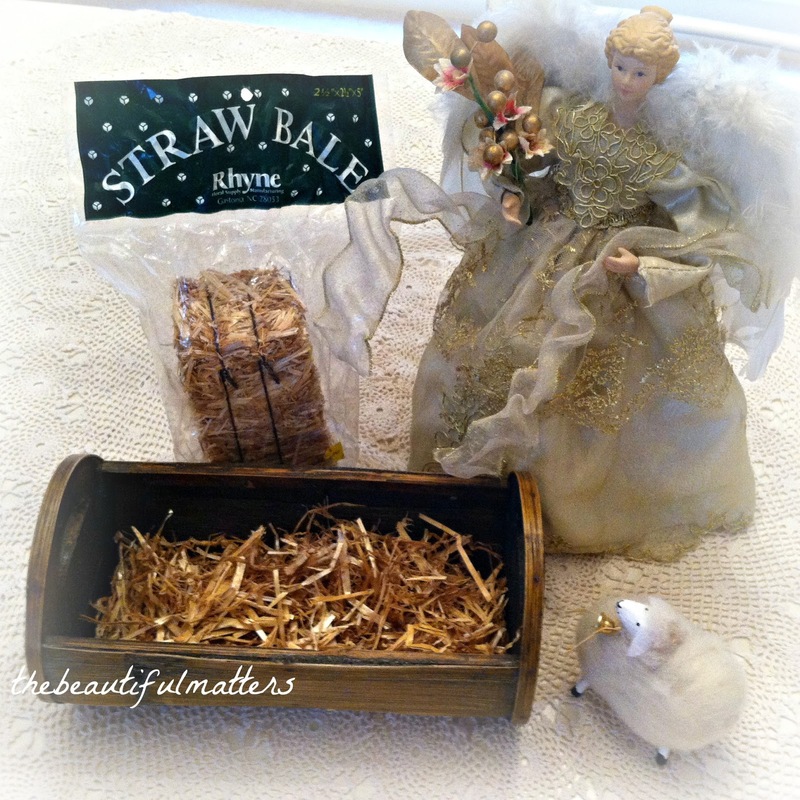 What a precious idea of adding straw to the manger for good deeds! Love that! Your Happy Birthday Coffeecake looks wonderful. I'd love to share a slice with you! Merry Christmas!! I love reading about others' Christmas traditions. When our children were at home we all piled onto our bed to open stockings in the morning, then had breakfast, read the Christmas story from Luke and opened gifts together. Now that there are in-law children and grandchildren, things have changed, but there is still the loveliness of being together celebrating Christ's birth. Those are darling little sheep. Wonderful traditions! Sweet sheep...my little lamb is looking up, too, but he's not nearly so darling. I've always thought he was rather proud and happy to be so close to Baby Jesus. The coffee cake sounds delicious! Deborah,I enjoyed hearing of your Christmas traditions. I loved your idea of waiting to put baby Jesus in the manger on Christmas day, makes perfect sense. I just may steal that idea from you. Alsoyour hay idea is wonderful! I had to chuckle and smile at your comment on the proportions of your nativity. They are precious. It is always a joy hearing of the traditions people share as familys. The Christmas Eve service at church was attended and then our Christmas morning tradition was a big breakfast of bacon and eggs before we could open presents. Of course the stockings were taken care of earlier but they mostly contained fruit and nuts - not like the contents of today. 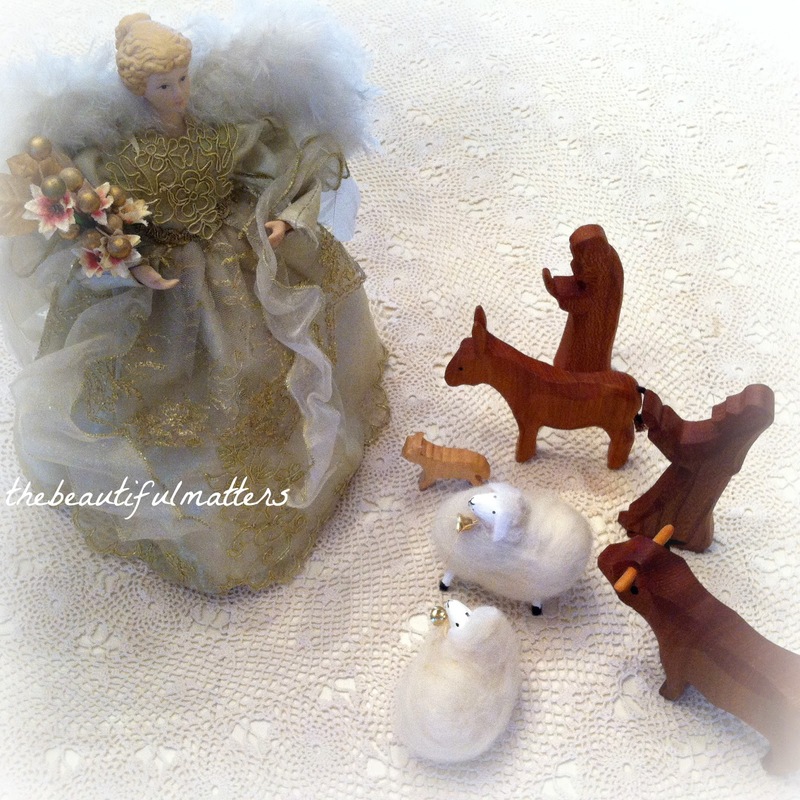 I recognized Kathy's sheep right away, they're really sweet. I love the idea of a Happy Birthday Jesus cake! You have some really gentle and kind Christmas traditions. In my family the presents from Santa are in a pillowcase at the foot of the bed. Eyes open, presents open. Everyone in our home is too old for that now. No-one officially gets up before sunrise on Christmas Day. Very nice breakfast, definitely not cooked. Consider the cook! Open the gifts under the tree. Do stuff. Phone everyone for a long chat. Relax and party. We used to go to church in the old days. Midnight mass was better. Not doing that any more as religious conflict has messed up the world. Keeping it cool at Christmas time now. Christmas dinner is actually lunch. Play cricket or swim afterwards. Eat leftovers. Walk along the beach. Laugh. Get active. Phone all the people whose phones were busy in the morning. Mentally plan Boxing Day sales strategy. What a pleasant surprise ! I was reading about your family tradition of coffee cake for Christmas morning and spied the little sheep. They look right at home there, and you've displayed them so beautifully. I am glad your daughter noticed they are looking up because I deliberately make at least one in a pair or flock looking up to see the angels and the star. Whenever I listen to people talk most fondly of Christmas, besides the most important aspect ~ our Savior, they talk about their precious memories of continued family traditions. traditions that are usually very simple, but held very dear. Thank-you for showing me pictures of the little sheep and your display. Lovely traditions, Deborah. 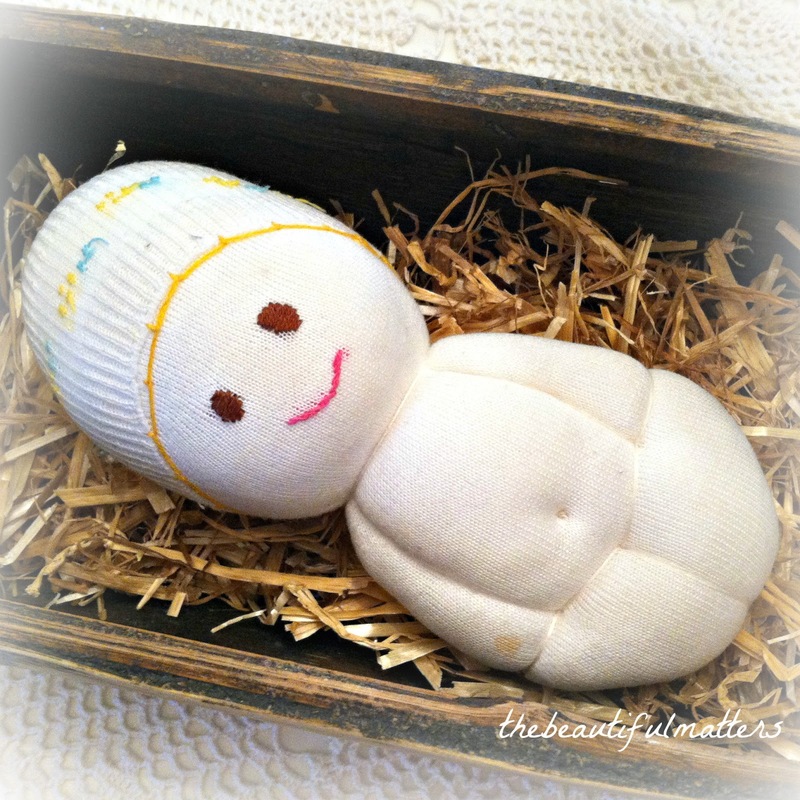 We do the same with the baby Jesus--he shows up in his manger on Christmas morning. We have coffee, scones, and breakfast pie (casserole) while opening gifts. And then Mommy takes a nap :) When the kids were little, we held an annual "Happy Birthday Jesus" party where we did a craft, told the Christmas story, and then lit candles on a cake for Jesus. Traditions make the season special and help us to remember what it is we are celebrating. 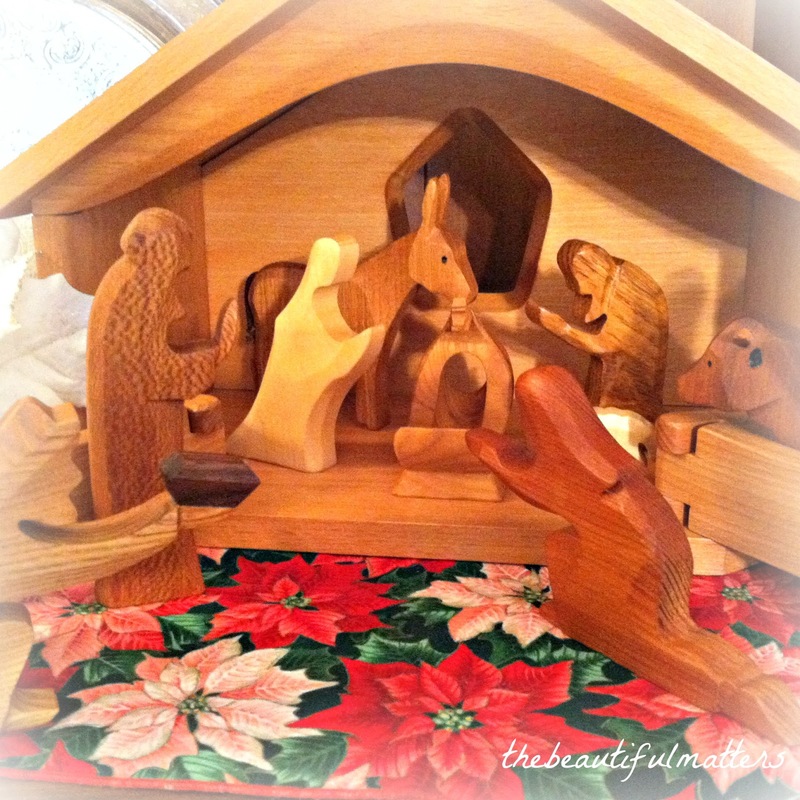 Such a beautiful Nativity and I enjoyed reading about your traditions. KathyB is one of the first bloggers that I met back in 2008. She is a talented and dear friend, as are you! This coffee cake looks so good.